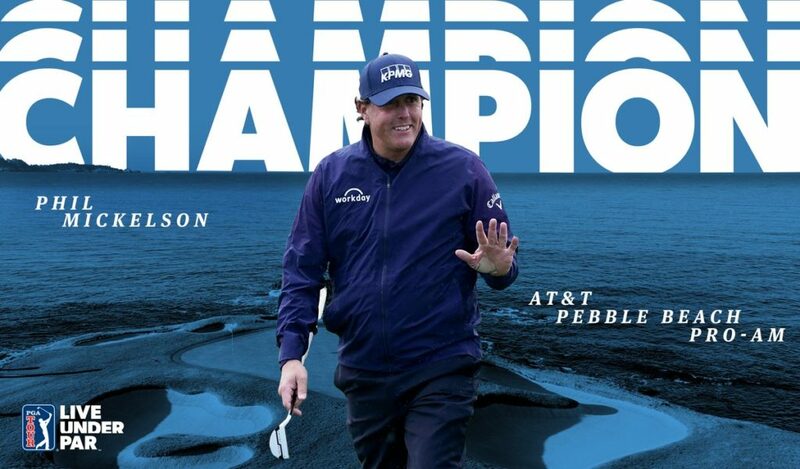 It took four days and 25 minutes of a fifth day for an apologetic Phil Mickelson to win his 50th career title in capturing the weather-affected AT & T Pebble Beach Pro-Am. Mickelson and England’s Paul Casey were back to the Pebble Beach at 8am Monday morning local time after the Sunday 16th hole ‘stand-off’ between the duo 14 hours earlier. ‘Lefty’ was adamant he could see in the closing darkness and wanted to go on, and clearly being unsportsmanlike and stubborn, while Casey couldn’t read the three-foot putt he was staring at. Common sense prevailed with Casey winning the backing of fellow Brit Nick Faldo in standing his ground and not wishing to continue. Casey then returned in bright Monday morning sunshine to hole the putt to remain three behind Mickelson for the duo to then par 17 and with the 48-year old Mickelson becoming the oldest-winner of the event in sealing victory with a final hole birdie in an official closing round 65. Casey, who had led by three shots heading into the final round, also birdied the last to grab second on his own with a 71 for a 16-under par total. “I was trying to win the regular tournament, as well, so this was also a big goal to win the team prize and with hat’s off to Phil on a deserved win, I am just go glad to get second on my own,” said Casey.